£2,161 was raised by 39 supporters — that's teamwork! 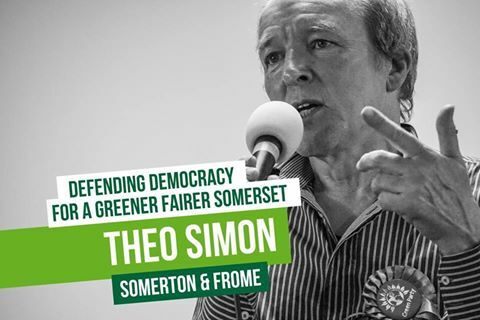 We are raising funds to support the campaign for Theo Simon as Green Party candidate for Somerton and Frome in 2017. Theo has made a short statement - below........but he has also.............made a great video on 28.5!!! It is well worth 30 seconds of your time! Theo was also filmed at the Packhorse Fair in Bruton on 29th May which is a slightly longer interview. "The snap election on June 8th is an attempted ambush on democracy by the Theresa May government. They hope that all their opposition will be divided and confused, and opposing voices will be silenced. We won’t stand idly by. I am glad to say that, here in Somerton & Frome we, The Green Party and our allies are united and clear about the challenge we face. Just 2 years ago we made our first Crowdfunder appeal, raising support for me as the Green Party Parliamentary Candidate. I didn't expect to be back so soon! In 2015 I was the first Green candidate since 1992. We went from nowhere in the polls to achieving 9% of the vote from 5,434 people. Our messages resonated with the electorate. Concurrently we gained 3 Green District Councillors on Mendip District Council. This year we have worked our socks off and earlier this month we delivered our first 2 Green County Councillors in Somerset. In the same two years, David Warburton, in his 2 years in parliament representing all 82,000 voters, has voted loyally with his government on almost every occasion. Their policies have created many negative things, including the rolling back of renewable energy projects whilst funding the white elephant Hinkley C, delivering financial hardship for our schools and health services, and a doubling of the number of people depending on food banks in East Somerset. Back in 2015, our first Crowdfunder raised over £3,000 in a couple of months. This time we need to raise it much quicker! You will appreciate we depend totally on the goodwill of individuals, not taking any funding from dodgy sources, or those seeking undue influence. It is you and me who fund this party! We need this money to fund the simple things, such as leaflets, posters, a little for travel and other associated expenses. We know many people will give generously of their time and physical resources, whilst others can give their time in the form of money. We welcome both! Please give us a few hours wages and you've given us a few hours of your time. We will happily accept whatever else you can afford. It will enable us to make a proper campaign. We have concluded our successful County Council campaign in Frome, and now at the beginning of another election, with a brilliant team, a powerful candidate, and the vision and ideas to build for a positive future here, whatever result this election brings nationally. We need to make sure that everyone hears our voice - a voice for urgent climate action, a voice for the people queuing at food banks, those battling with student loans, those struggling with finding and affording housing, and a voice for all our families, friends, workmates and Somerset businesses exposed to the reckless intentions of a hard-Brexit government. This is no time for indecision or shyness. Please support me if you can, as The Green Party seeks to support every voice that speaks up on our behalf and stands up for the planet. We will take the opportunity of this electoral ambush to ambush the sitting David Warburton and expose his destructive government for the dangers it offers good people of Somerton and Frome. Thank you, and please both give generously and urge others you know to do likewise. Every little will most definitely help." Receive a poster, and a big thank you hug. P.S. the hug is optional. £10 – Votes for Theo - all rewards are optional. Not taking rewards ensures we have even more money to support the campaign. Supporter! Join our group of grass-roots supporters – you are supporting a vibrant team. Receive a campaign pack including posters and leaflets to share with neighbours. Get involved and tell your friends - small steps that make a huge difference. You could easily become one of our heroes! You will receive all of the above, and will sleep well knowing that your contribution is sufficient for us to print enough leaflets to deliver to many hundreds of households. This is one of our most effective campaign elements to help win votes. Feeling flush? Can you help us really get our messages to Somerton and Fromes’ electorate? Receive all the above. Your contribution is enough for us to develop and run a specific social media campaign. Thank you everyone who has helped us raise the deposit. Can you now help us fund the campaign? Make History and help elect a Green MP in Bristol West! Molly Scott Cato MEP will stand in Bristol West for the Green Party in the early General Election on June 8. Donate and share now. Independent Mayor George Ferguson has the vision to lead and the drive to get results. Support George to keep the great Bristol momentum going.